The history of the merengue is quite complex and somewhat unknown. 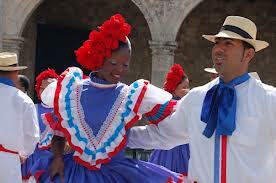 However, what is known about it speaks for the rich culture of the Dominican Republic and it can be concluded that this dance form is truly the “national dance of the Dominican Republic”. The controversy of the meringue lies in its origin and it is unclear how the dance actually was formed. So to even begin to dissect into this, it is important to first learn and understand the history behind the island of Hispaniola and behind the music and dance themselves. The island of Hispaniola is now known as two different countries; one third known as Haiti and the other two-thirds known as the Dominican Republic. In 1697, Spain ceded one third of the island of Hispaniola to the French, would created what we know as the Dominican Republic but was then called Saint-Dominique. By 1790, the French had about 500,000 African slaves being managed by only about 57,000 whites and freedmen, or colonists. In 1791, a portion of the slaves fought back and slaughtered numerous Frenchmen causing some to flee to Cuba with their slaves. Haiti still ruled over Saint-Dominique until about 1844 when it was then termed the Dominican Republic and then the United States took on the role of helping to support the newly formed nation. A powerful military leader, Rafael Trujillo was the first democratically elected representative of the new Dominican government but he was actually a brutal dictator who continued to oppress the rights of the people. The nation of the Dominican Republic went through a really devastating line of dictators before the United States intervened once more to restore the peace in 1965 and since then the Dominican Republic has been a democratic nation. The merengue is not only the nation dance of the Dominican Republic but is also claimed to be the most famous Latin American dance holding much national significance to the country. As I said before, the exact origin is unknown for merengue but it has been agreed that the dance was formed over two centuries ago! There are a few stories circulating about how the dance found its start. The first is the result of a group of partying villagers who out of sympathy for a war hero who had just returned home with a limp. The soldier came back, most likely after the uprising from the slaves in 1791, and the villagers danced as though they had been wounded too. The second is based upon the foot dragging movement that resulted from slaves whose feet were chained together as they cut sugarcane in the field during a day’s work. Slaves living on the island of Hispaniola watched the European colonists perform their slave master’s dances and incorporating the foot dragging motions along with setting the beat to drum sounds to make it more rhythmically entertaining. 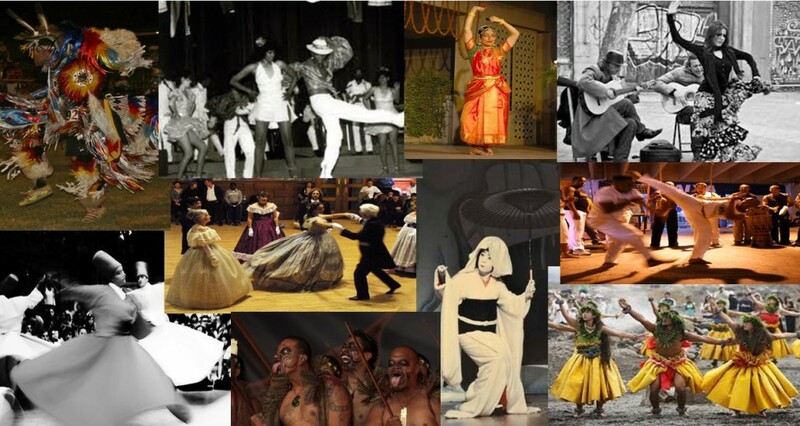 Merengue itself is a fusion of European and African cultures and quickly became the most popular form of dance in the Dominican Republic because of the simple steps and movements. Partners could either hold hands throughout the dance or separate while still maintaining close contact. Dancers would add steps frequently and attach an individualistic style onto the dance form. The term “merengue” is a Spanish variation off the word “meringue” in French which translates to “a confection made from whipped egg whites and sugar”. The description applies to the “light and fluffy nature of the dance where one gradually shifts their weight between feet in a very fluid motion” and refers to the dancer’s sweet and frothy character. The original merengue was strongly influenced by European contredance but due to the vast African influences on the island, the dance quickly inherited strong Afro-Caribbean rhythms which in turn livened up the dance to a great degree. The original form termed is the merengue típico and it has a very set structure, really highlighting its European influences. There is a slower instrumental walking section which continues into a softer, lyrical section where the singing begins. The last section is a call-and-response type of directional dance. In this form, the audience participates by dancing a basic two-step pattern to a very fast tempo. In the merengue típico, the unique factors are the use of the accordion and saxophone for the instrumentation to highlight the period of jazz that was occurring elsewhere. The second form is Ballroom merengue where all the steps are on a set beat and have that limping characteristic in the feet and body movement that was described in the story about its origin. It is a partnered dancer where they hold each other closely and perform rather simple choreography where twirling and spinning around in a slow circle is seen. Though the speed may increase of the music, the movements remain slow, controlled and centered. The second is Club merengue and the form development from the ballroom type but incorporated a much stronger sense of erotica and urban feelings. It is definitely a form that is more popular with the younger population. The last type is termed Folk merengue, which is perhaps the most familiar to the merengue típico. It can be found practiced in the most rural areas of the Dominican Republic. Dancers tend to move their hips in a full circular motion while maintaining a straight and upright body negating the more well known back and forth bodily movements. The history of the merengue is quite traumatizing in the fact that there were many social and performative barriers put onto the dance that caused its rollercoaster-like history. There was such disturbance within the social class of Dominican people because the ability to perform and practice the merengue was determined by the dictator that was in power at a particular point in time. When Trujillo was in power, he scrutinized the upper class as he always disliked them coming from a lower class himself and made merengue a huge part of his campaign and ruling. In a roundabout way, he did start to bring merengue into a more social and widespread setting by doing what he did. Today the merengue continues to be thought of as a significance of cultural pride for the people of the Dominican Republic but strives to maintain the sense of individuality and beautiful, tactile rhythms that make the dance what it is! Capoeira is most commonly referred to as a Brazilian martial art. 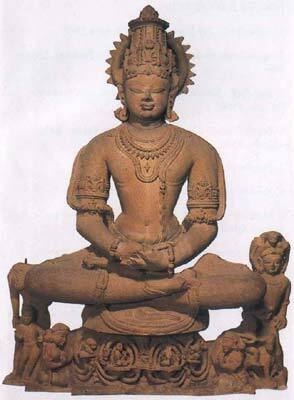 However, both fighting elements and the artistry of dance can be found in its practice. Its utility is found in its making the discreet practice of fighting techniques possible. 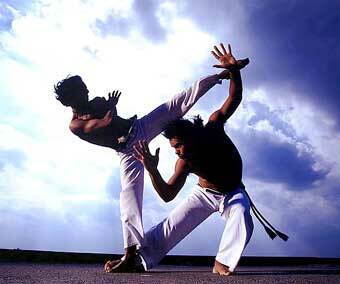 It is debatable whether Capoeira is a form of dance or martial art. Nevertheless, it is considered a game, a part of afro-Brazilian tradition and culture. 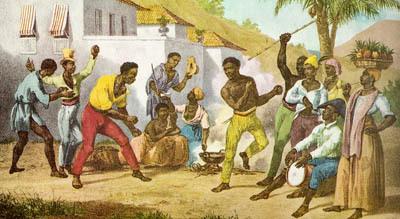 It originated among the African slaves in Brazil through the sharing of dances from their varying cultures, rising from the oppression and poverty that the slaves endured in daily life. It became its own dance which accompanied their festival of Nossa Senhora do Rosario as part of a competition to crown the “King of Kongo”. It was also played in the streets, along with other games and dances, as a part of preserving African culture in a passive rebellion against those that owned and oppressed them. As some may know, in Africa there is no direct translation for the word “dance” because it is not seen as separate from the music, song and costume. Capoeira fully embodies this concept of performance. Capoeira is practiced in a circle, or ronda. People gather to sing, play music and witness the game. The berimbau and drum dictate the rhythm, or mood of the game. This element of African culture, despite the hybridization that created the Capoeira art, is evident and holds strong through the centuries. 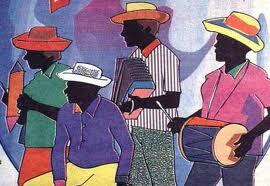 The majority, if not all, African traditions were looked down upon by the upper class in Brazil in the 19th century. Compared to the European culture to which they were accustomed, African culture was barbaric and primitive, full of vulgar dances with gyrating bodies and loud music. All precautions were taken to prevent the preservation of their cultural practices. Capoeira, being a fighting game, was no less immune to opposition by the upper class. By law, Capoeira was considered a form of disturbing the peace, supposedly because often times the games lead to shouting and throwing rocks. At this point in history the slave population in Brazil greatly outnumbered the European population, and it is likely that this “disturbance of the peace” was used as an excuse to arrest and imprison all capoeiristas out of fear that they would lead an active rebellion against their European masters. Capoeira continued to be practiced illegally until 1932 when Manoel dos Reis Machado, or Mestre Bimba, decided to formally teach capoeira, creating a structured methodology for Capoeira and opening a capoeira school. 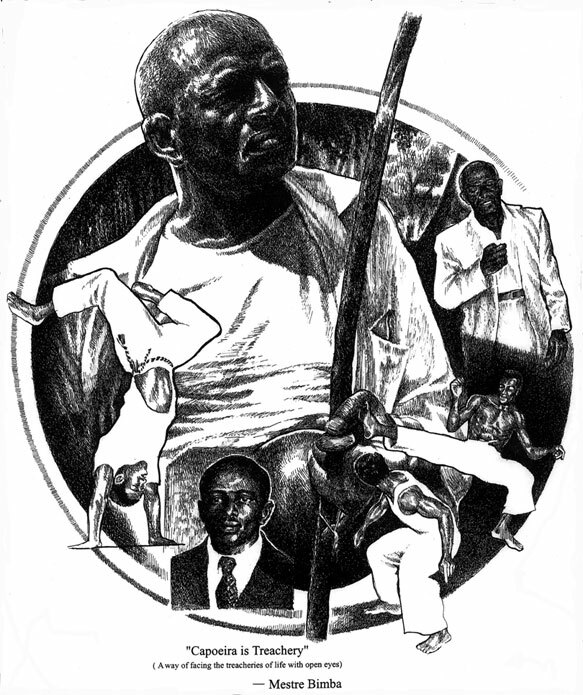 After he performed a Capoeira demonstration to government officials in 1936, Capoeira was made a legal practice. A capoeira battle today is one of the greatest displays of energy and power that one can witness. The bodies are constantly in motion, a call and response, an exchange of strikes and evasions, riding momentum and sustaining a mentality of cunning. The object of the game is to trick your opponent. 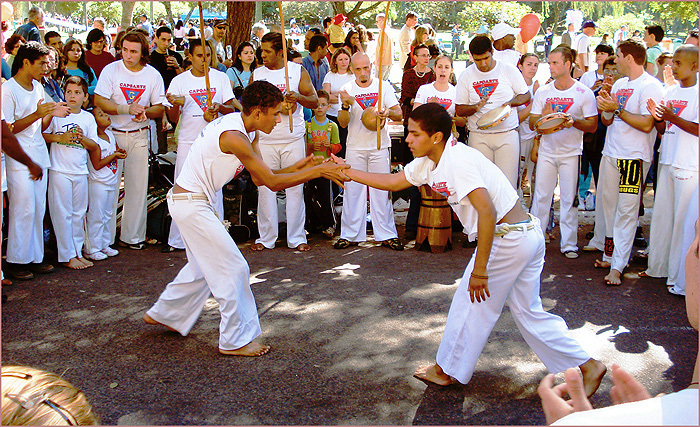 It is a battle of wits, thus trickery is one of the most important elements of the Capoeira game. Because each fighter is an individual, their trickery is unique just as they are unique and this is the part of Capoeira that comes from within, from passion, from the heart. In this way it relates to the practice and performance of dance. In a Capoeira battle, one can observe the fighters maintaining eye contact, even whilst upside down, using direct focus to help them to evade an attack quickly and strike again immediately. The bodies in motion remain in motion, elastic and resilient, bound on attack, ready to respond to any impact or impulse they sense. Similar to the martial arts of other regions of the world, a major principle of the capoeirista mentality is to restore and/or keep peace. Although it is a battle, each fight begins and ends with an acknowledgement of respect in the form of a hand shake, or a nod of approval. There are formal schools of Capoeira, but unlike other martial arts, Capoeira is still a part of the street culture of the people of Brazil. Poverty and oppression and the segregation of classes still exist in Brazilian society, thus the fighting spirit from which Capoeira manifested lives on, and so does the debate on whether it is dancing or a martial art, dividing its practice worldwide into two major schools of thought. The first seeks to preserve Capoeira as a martial art, holding strong the tradition that the slaves had developed as a means of rebellion against their oppressors. The second seeks to preserve Capoeira more so as an art form, recognizing the expression of an oppressed people and the spirituality that accompanies the practice. Such passionate expression is so identifiable and unmistakable that it can’t go unacknowledged. The metaphorical fight against oppression, I believe, makes room for this interpretation of Capoeira as more than just a Brazilian martial art, but also as a dance form. 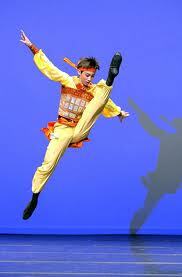 Chinese dance is divided into two categories. One category is based upon the warrior exercises of Chinese warriors. The other is based on Confucian etiquette and ritual dances. The second form evolved over time to turn into today’s classical Chinese dance. The history of classical Chinese dance date back to the Quin Dynasty of 220BC, where images of dancers in temple rituals were seen in artwork on pottery. 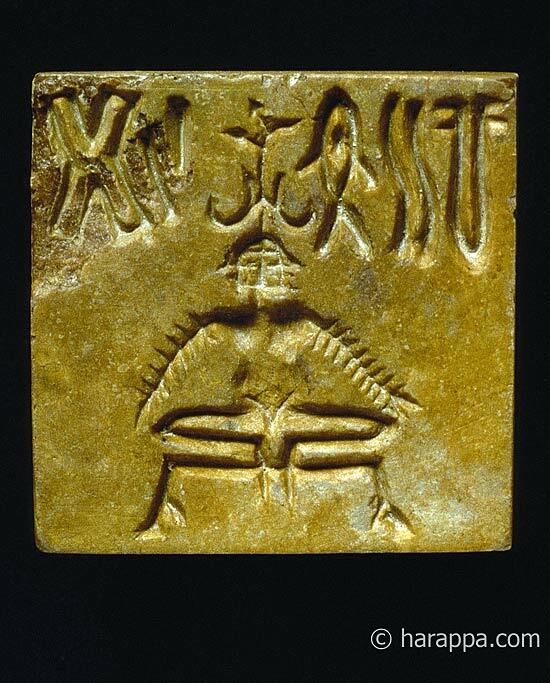 Each dynasty that followed had their own specific moves or movement qualities that they favored and incorporated into their own ritual dances. 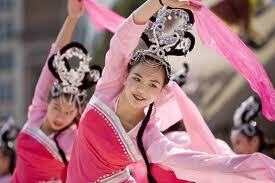 Therefore Chinese dance ultimately was created by the 5,000 year old history of China. igid like ballet). Not only must the continuous path be circular but each articulated movement in the form of classical Chinese dance is specifically choreographed. This includes the specificity of the angle of the hand and wrist in relation to the angle, of the head, focus of the eyes and expression on the dancers face. Additionally the dancers are taught how and when to use their breath and knowing where exactly the movement comes to rest. Breath is one of the most crucial elements of Chinese dance. It leads the body through the phrases in a way that aids the fluidity of the circular motion. In the practice of the form dancers strive for excellence in twisting leaning roundness and flexion. In the east its is said that the is “beauty in roundness.” All movement pathways must be rounded and full. Bearing of the material is something that many believe makes classical Chinese dance special. It is the cultural heritage behind the movement that native Chinese dancers are able to bring to the material that they are performing. It could also be seen as the pride of dancing an art that your country has create. Chinese dance is intriguing to me because of its circular pathways. They are hypnotizing to watch. As I tried to recreate them myself I understood the importance of flexibility in Chinese dance. My joints were being used in every direction to imitate the fullness of the movement. The Dabke is an Arabic folk dance that started in the mountainous regions above the Mediterranean coastline and the Tigriss River. When the Dabke dance was first created it was mainly danced by people of the villages and towns of Lebanon, Syria, Palestine, Jordan, Iraq, and some quasi-bedouin tribes that were living in nearby territories. The region that I am going to focus on is Lebanon. 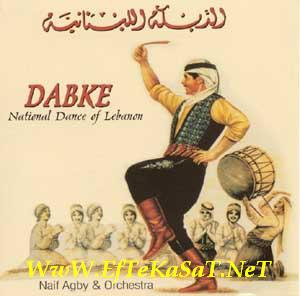 In Lebanon, the Dabke dance was originally formed because of the different seasons Lebanon was exposed to. When the weather changed in Lebanon, the villagers had to adjust accordingly and they ended up forming a dance based on building their homes. In Lebanon, and many of the other regions where the Dabke is danced, the roofs were flat and made of tree branches that were topped with mud. Therefore, when the weather started to change the mud would crack and the roofs would have to be fixed. To fix the roof the Lebanese would hold hands, form a line, and start stomping their feet while walking on the roof so that the mud would adjust. 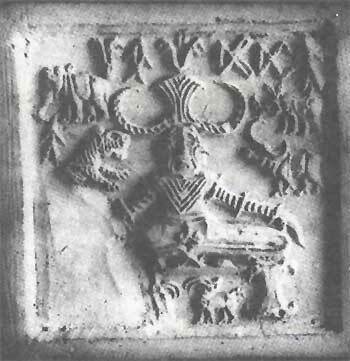 In historical folklore, it is said that when the mud started to crack the owner of the house would call to the neighbors to have them help with the roof. He would yell, “Al-Awneh” which translates to “let’s go and help.” Then all of the neighbors and family members would get on the roof and start stomping to adjust the mud. Thus, this leads to why the Lebanese are very traditional and their families are close to each other. With the ancestral tradition of the Dabke, family is thought to be a whole village, which I believe is why so many Lebanese families and Arabic’s connect with one another because in some ways they both have the same historical heritage. Once many years passed and the villagers found new ways to build their houses, the Dabke was passed down through families as a tradition of how their culture was built. The words sung while dancing the Dabke were also passed down from when the families and neighbors would help each other fix cracks in their roofs. The term, Daloonah, is a form of improvised singing while dancing the Dabke. In the ancient times of the Dabke, Daloonah (improvised singing) was created and added to keep the men working in the cold weather warmer because singing helped them stimulate their blood pressure to produce more energy while working in the cold. 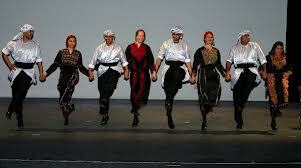 In today’s Lebanese culture the Dabke is still danced and is one of the Lebanese’s most famous traditions. The Dabke has been passed down from generation to generation and is performed in almost every Lebanese household. The Dabke passed down throughout history has been made livelier and more joyous and is usually performed or danced at weddings, special occasions, and family gatherings. However, when the Dabke was first created the dance was slow and static. The dance progressively began to change after the First World War when many immigrants were coming to Lebanon, and the dance has further changed in minute ways from generation to generation. Today the Dabke is a line dance where everyone stands in a line holding hands facing outwards or to the audience (if there is an audience). The dance usually starts with a musician playing a solo and then the dancers start to move together creating a synchronized movement and step. This usually consists of stepping with the left foot and right foot and then crossing the left foot and right foot over. Each of these steps has a little hop, kind of like a Greek dance. While dancing the Dabke, there is one main leader, usually a male called the “Lawweeh” who is expected to be the most skilled in the group of dancers. The Lawweeh should be able to improvise and is usually extremely light on his feet. The Lawweeh directs the dancers to slow down or speed up and helps keep the energy of the dance while giving directions. He also may sing out in song, break out of the line to improvise by himself, or try and get more family members or audience members to join the line as well. The Dabke is a dance that has been passed down over time and still resonates with many people all over the world. Like many other dance forms, Dabke started in a culture that was going through struggles, looked for ways to make things enjoyable, and turned to dance. I believe the Dabke dance will continue to be passed down through the generations and will hopefully continue to remind people of how their roots as a culture were established and how they are heavily impacted by their ancestors and historical traditions today. The earliest evidence of the Can-Can was found on a wall frieze in a tomb in Egypt from between 2500 and 2350 B.C. The first recognized appearance of the Can-Can was in the working class ballrooms in Montparnasse, Paris in 1830. The Can-Can evolved from the Galop which was danced in 2/4 time and was reminiscent of the Quadrille that made it’s way around Europe. 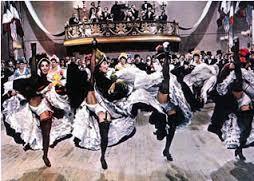 Since it was derived from the Galop, the Can-Can was originally a dance for couples. 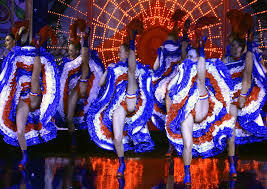 This soon changed, and the Can-Can became more of a lively dance performed on stage in a chorus line style. 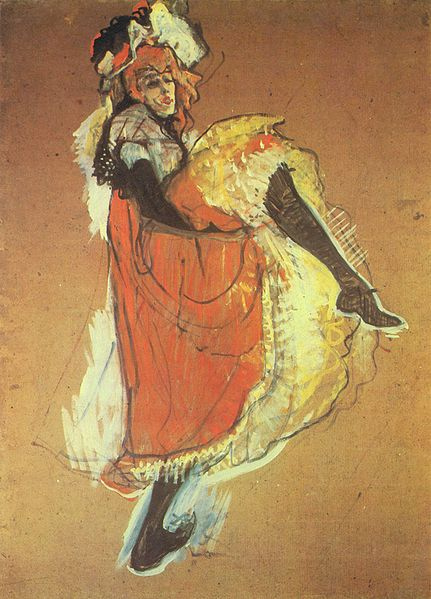 In addition to the public performances, the Can-Can was performed in private by courtesans to seduce clients. With the development of the dance form, it changed from a provocative dance to a polished, technical, and respectable dance mainly dominated by women. As the dance progressed throughout the 19th century, the performers were seen in places such as the Moulin Rouge, and were very well paid. However, there were attempts to repress the dance form. Costumes and movements were influenced by the morality, politics, and fashion in Paris at that time, but it was thought to be too sexual and suggestive. Typically, female performers would wear long skirts, petticoats, and black stockings to add attention to the legs during the high-kicks. The long skirts were also used to conceal lacy undergarments. The skirts were imperative for the performance as the dancers would manipulate and lift up the skirts during the dance. For men, the dress code was not as strict. It was more about showing off their athleticism rather than sexuality. The costuming and high energy movements paired well with the upbeat music that was played in 2/4 time. One of the most recognizable songs for the Can-Can is “Gaite Parisienne,” composed by Jacques Offenbach.